As it was mentioned in the paragraph Material Request for sample submission to Secugen you can send your sequencing samples to Secugen in Eppendorf® tubes or 96-well plates, previously supplied by Secugen. 96 Well plates should be used to send 48 or 96 samples (half plate or whole plate). In case of sending only half plate (48 samples), these should be plated only in even or odd columns, as it is shown in the following picture. We cannot process in a half plate a number of samples below 48. Therefore, if you have less than 48 samples and you do not want to be charged for a completed half plate (48 samples), please sent the samples of the incomplete plate in Eppendorf® tubes. If fewer than 48 samples are sent in a half plate, 48 samples will be charged. The same applies in the case of 96 samples. For correct sequencing, it is required than samples have a suitable DNA volume and minimum concentration prepared in bidistilled water (see attached tables). * For different DNA type, please contact us. *Important Note: If this is the first time you are sending samples in 96-well plates or samples that require to be processed under special conditions (BACs, fragments phages…), please, contact our lab sequencing staff for technical support. *Important Note: The Promega pCI-neo plasmid cannot be sequenced with the T7 primer due to a base pair of difference at the 3’-end. For sequencing this vector, primer T7 (pCI-neo) should be used. In a single purple tube or 96-well plate, you must dispense both the DNA at the concentration indicated above and your own specific primer at 5 µM, both in bidistilled water as follows. Samples in tube: 15 ul of DNA + 1,5 ul primer at 5 µM. Samples in plate: 5 ul od DNA + 0,5 ul primer at 5 µM. If you expect any difficulties in sequencing your samples, it is important that you contact us in advance. Our laboratory staff will give you advice and technical support to solve these difficulties. Together with the tubes (white or purple) or the plates that you request prior to sequence with us, you will receive a set of barcoded labels. For each sample you will get a set of three identical labels. 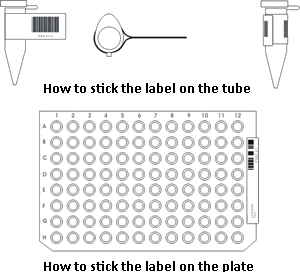 Attach the first label to the sample tube as indicated below figure. Place a second label in the space available for it in the Request Form. At the same time please indicate the annealing temperature of the primer and any other remarks about your sample, using the blank space available at the label side. The third label is for the customer. We recommend that you stick it to your lab notebook or registration book together with a description of your sample. You will need this label to later on be able to identify the DNA sequence corresponding to that sample. Samples (tubes or plates), together with the Request Forms should be sent to Secugen by standard mail or courier at room temperature.